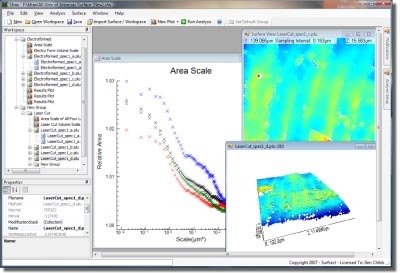 Surfract provides software and services for analyzing surface texture, or roughness, to support quality control, product and process design, and research. Sfrax 1.0 has been officially released. To download the latest version or register for a Trial copy go to http://licensing.surfract.com. In addition Sfrax provides an extensible interface that allows for additional analyses to be made available from both Surfract and third-parties. For more information or to pre-order Sfrax please see our Products and Purchasing pages. Recently featured in a paper in Nature magazine (Dental microwear texture analysis shows within species diet variability in fossil hominins), we have developed a simple user interface (Toothfrax) to allow anyone to perform the analyses described in that paper. For more information please contact us at support@surfract.com. As of August 4, 2005 the Kfrax Analysis System and Kfrax DLL's are now available. For more details on this release please see our products page. Supporting the latest ASME B46 fractal standard, Surfract's software package, KFrax, provides a variety of surface analysis algorithms including a patented Area-scale analysis. In collaboration with the WPI Surface Metrology Lab, Surfract has participated in groundbreaking research. With Christopher A. Brown, Ph.D., PE, Surfract has over sixteen years of experience applying specialized, scale-sensitive fractal analyses to measured surfaces and profiles. We invented and patented area-scale analysis for surface texture, and we have experience with many types of surfaces and applications from runways to skin, contact lenses and hard disks. Our specialized analyses can relate surface texture to product performance, manufacturing processes, and surface behavior where conventional analysis cannot.